Amazing news! 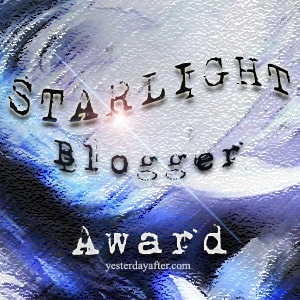 I’ve been nominated for a Starlight Blogger Award! The award was created to (in Carolina’s words) ‘honour those individuals who bring daily light into your soul with their creativity’. I’ve heard of this award before, but I never thought I would be nominated. When the lovely Holly nominated me, I felt so happy and it is so kind of her to nominate me. I greatly appreciate Holly’s thoughtfulness. Holly is based in the Midlands and her awesome blog is called Mellifluous. She blogs about beauty, fashion and lifestyle. Please check out Holly’s blog, it’s brilliant. My mum is so inspiring. She’s a wonderful person with such a kind heart. She sticks by me no matter what I’m going through. I also find going on walks inspiring. I can take some time out to think about everything and process my thoughts. 2. When you’re having a bad day, what can put you in a good mood again? If I’ve had a bad day, I usually relax and unwind by lighting some Yankee Candles as soon as I get home. They just make me feel so much better and their scent fills my lounge instantly. I usually also put some TV on which doesn’t require much thinking, such as reality television like Made In Chelsea, The Only Way Is Essex, etc. If I have time, I live near some beautiful gardens which are lovely to sit down and chill in, whilst the sunshine is out. 3. Three things that you want to do before the end of the year? One: For the past year or so I’ve been having a constant battle with my weight. I’m currently trying to re-gain control. I want to do this for myself and feel happier in my own skin. Two: I’m currently looking into going back to college part time, to fit around my full time job. I want to have that all finalised in the next couple of months. Three: I keep missing out on blogger meet-ups for multiple reasons. I haven’t seen any meet-ups advertised for a while now but I’d love to attend one before the end of the year, or even organise one myself. That would be a really big thing for me if I did organise a Sheffield bloggers meet. The reason I’ve chosen you guys is because you’re all so brilliant and inspiring in your own unique ways. I love your blogs and you’ve all took the time to speak to me via Twitter. I’m in such a positive frame of mind today, so the questions I’ve chosen for you all have positivity as a general theme. 1. Who do you most admire in life? 3. What does the perfect day look like to you? Well done guys! Apologies if I’ve nominated you and you’ve been nominated before, it’s just because I think you’re so awesome. Thank you again to Holly for nominating me. "Yankee Candle – My Fragrance Of The Week: Luau Party"